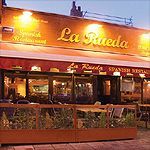 La Rueda is a Spanish themed restaurant and bar that has weekly DJ nights. Do you work at La Rueda? What did you think of La Rueda? Large table was booked for a 60th birthday party. Food was delicious, restaurant accommodating for decorating the table...right up until one of the waiters broke the delicate birthday cake I had delivered myself, with clear instructions to be careful. Was offered flimsy excuses, panicked apology and the cost of having the cake cut (really!) was waived. It cast a massive pall on my evening, having been reassured that the cake would be handled with care. Take your celebration cakes at your own risk. I am an expat American living abroad (Spain) and came to London to visit a friend who resides in North Clapham. We were taking a walk in the neighborhood and "accidentally" stumbled upon La Rueda. We ended up loving the place. We arrived after a dinner out and were looking just for a nightcap and good music. We love the fantastic music, dancing, and viewer-friendly waiters. La Rueda has a lot of Latin expats either from South America, Spain and other Spanish speaking countries. It has a true Latin American vibe. I am sorry to hear that others complained about the food but every time I come to London I return to La Rueda simply for the atmosphere, music, dancing and to meet new people from all over the world. For those of you that like Latin music and culture- I think you will enjoy this spot. I have been to La Rueda on several occasionsa and have had a fantastic experience each time. Their food is simple and authentic and the place gives off a great vibe. Your servers are happy to converse in either English or Spanish and are patient with those wanting practice. I could not find fault with this restaurant and the fact that they have live musice even on a Sunday night tops the weekend off perfectly. To those not wanting attention from other tables don't blame the restaurant they can't filter out all the chaff. This is one of my most favorite places to go with my partner for an intimate meal or with friends for some great tapas and drinks. I firmly believe you need to experience this place in small numbers first to really appreciate the place. Give it go! Went here last night and had a fabulous time!We had just finished work and were sitting next door in Aquum and due to the amount of people in La Rueda finished our drinks and went next door. By that time the live band had finished unfortunately but there were still people dancing to the Spanish music and generally having a good time. The drinks weren't too expensive and both my friend and I said that it was pretty authentic - as in we actually felt like we were in Spain (if we ignored the fact that Clapham High Street was just out the window!) due to the amount of Spanish people in there and just the general atmosphere that it exuded. After hearing good reviews La Rueda I booked a table in October 22 people. I called a week before to add another four and was assured that this was not a problem. On arrival we were given a table for 22. Fortunately two people had cancelled, and we managed to cram another 2 settings onto the table. Our waiter was polite and efficient and everyone enjoyed their starters, but the main course was awful! The paella was completely flavourless and very over cooked. All of the medium rare steaks arrived well done. Several people sent theirs back and I sent mine back twice. As 20 out of 24 guests were unhappy with their meal I wrote to the manager. I sent the letter in November and have not had a response, which I find appalling. I can assure you that none of us will be returning to La Rueda. La Rueda is the tackiest and cheesiest place I have ever been to. I had a horrible experience there, it's full of horrible people and is an insult to Spanish cuisine. I don't normally go to places like this but it was my boyfriend's work colleague’s birthday. The moment I walked in I couldn't believe my eyes, I wanted to leave. There were eleven of us and therefore the staff didn't give us the choice of an ‘a la carte menu’ but selected a set menu for us. I guess this is because it was Saturday evening and it would have made it easier for them. The selection was (at least I hoped) decent but when the food arrived it was appalling. My melon tasted of garlic and I would guess it had been cut with a dirty knife and the paella, I have no words to describe it apart from inedible. La Rueda was packed with people celebrating birthdays and hen and stag nights so it was too loud and vulgar at times. How can people call it a nice atmosphere? One girl from the table next to ours even came to ask me whether I was going out with the guy seated in front of me (my boyfriend!). La Rudea is meant to be a restaurant not a pick up place! Do not go to this place, with all of the nice restaurants in the area, you are better off elsewhere. La Rueda is a no-no!